The projected increase of IT spending this 2017 leads us to think of business growth and innovation. However, the truth is, much of the enterprise IT budget goes to “keeping the lights on”, which sole purpose is to support its IT hardware maintenance and prevent its current system from crashing down. According to Gartner, eight out of ten dollars that companies spend on IT is “dead money”, which does not contribute directly to business growth. This makes up at least two-thirds of all IT spending used to sustain the business, not to change or transform. Most companies operate in a mixed IT environment with various IT hardware from multiple vendors. Each equipment has different hardware maintenance needs and different warranty expiration date. The quality of IT support and maintenance services vary depending on the unit and specific requirements. Maintaining multiple hardware maintenance contracts across equipment means high administrative overheads. When something goes wrong and you need spare parts immediately, how fast does your vendor gets to your premise? How reliable is your current hardware sparing strategy? Your organisation could be dealing with multiple contacts for various vendors. When a technical problem arises, sometimes you have to call overseas for the vendor’s contact centre just to have an answer to your issue. You can not immediately have the spare parts or computer parts you need because you have to go through a series of process, which delays the resolution to your problem. Undoubtedly, OEM engineers have the technical expertise, experience, and superior knowledge in providing maintenance support. However, they can not diagnose and resolve issues across multiple-vendor platforms. If your issue affects several pieces of equipment, this could lead to finger-pointing and delay of resolution. When an OEM vendor declares an End of Service Life (EOSL) to your hardware, they will no longer offer maintenance and support to your current equipment. Instead, they will offer you hardware upgrade. Before jumping into a decision of following the OEM recommendation, ask yourself this question: Is this going to help me get the most of my existing IT hardware investment? Challenging the status quo and finding options to remedy those various IT issues can be a worthwhile and rewarding venture. 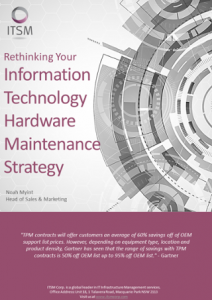 Discuss the challenges you have in your IT hardware maintenance. Call +61 2 8355 1080 and talk to an ITSM Consultant now. You may also click the image below to schedule a consultation. What IT Support Services Can Your Organisation Outsource? Will Sun Still Shine for SPARC and Solaris? 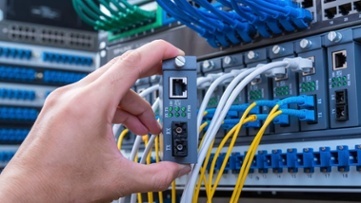 Learn how to break from the expensive Hardware Maintenance trap. Download this free eBook now!